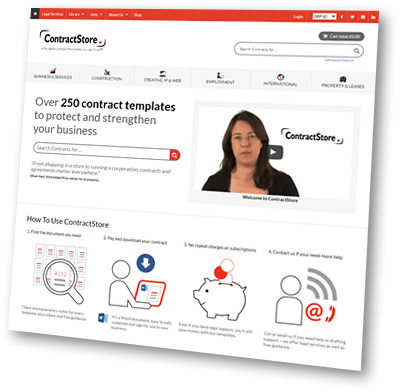 We are delighted to tell you that ContractStore has updated its website with a faster, mobile-friendly design and a number of new features. Among these, anyone buying 3 or more ContractStore documents at a time will get a discount of 15% on the total price. Purchases can be made in Stg£, US$, Euros or AUS$ and our payment system now deals effectively sales to VAT registered companies in Europe. And in addition to our existing Guidance notes we are increasing our videos with information on topics ranging from choice of confidentiality agreement to contract advice for those wanting to build a new home. Please note that if you are an existing customer, you need to register again the first time you buy a template, but you are free to use the same login details as before. Have a look at the new site and we look forward to hearing from you. All comments are welcome. This entry was posted in ContractStore Updates. Bookmark the permalink. It was far better than being psycho-analysed. It gave me a completely new idea of myself.